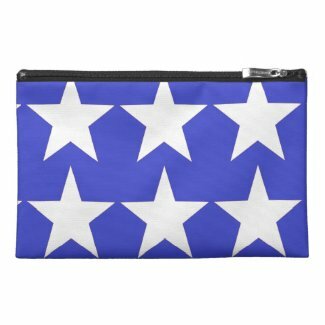 This Star Travel Bag was created very simply using freely available tools on your computer and on zazzle.com itself. See if you can see the steps I took from the item itself. The first step was to open paint and go to the Home Tab and choose a design shape, Ovals, rectangles, stars in many forms are all there. I shrank the design page to minimum and drew the five pointed star. Then maximized the pattern remember just one star outline on the page. Uploaded the saved outline to zazzle.com. Chose the item to have the design added. In this case a make-up bag. Moved the design around a little to get better design then chose a background color from the design tool. From there I simply posted for sale and chose my percentage mark up and items I wanted the design to appear on. See how simple it is to create effective designs for yourself.